Today, driving west along County Line Road, probably little note is taken of the brick pillars that announceOakdene. They form the entrance to many present-day residences, their acreage drawn from what was once the woods the orchards and rose gardens, the vineyards, and pastures and ponds, that comprised the grounds of a much-loved property that Edith (Dent) and Alexander Reichmann of Kenilworth created after they purchased 120 acres from Mr. and Mrs. Robert Hammond in 1921. The story of Oakdene is told in Reichmann’s privately published memoir, “Reminiscences of Alexander F. Reichmann”, in the chapter called “The Village in the Woods”, printed in 1958. The Reichmanns were from rural Le Mars, Iowa, he a country lawyer who brought his skills to Chicago at the end of the 19th century. Edith (her father was a cousin of Julia Dent Grant) was a horsewoman and plantswoman. But city life was not to their liking and in 1903 they were among the earliest residents of Kenilworth, a “suburban dream” village founded by Joseph Sears. Life was more to their liking there, however, over the next 20 years Kenilworth grew in residential prestige, and the Reichmanns turned their eyes back to the country. By 1923, the Oakdene acreage became their permanent home once they had adapted the old homestead for their use. They set about creating a diversity of landscapes that included pastures for livestock, woodland glades where wildflowers bloomed again, trellises with grapevines, lilacs, and eventually, Edith’s dream, a rose garden. They made a variety of wines, stored in barrels in their wine cellar. Edith’s garden was designed by her neighbor, Mrs. Robert Hammond, who in 1925 became the first president of the newly chartered The Garden Club of Barrington. Edith Reichmann was the vice-president and with its charter members was part of the social transformation of Barrington’s countryside from gentleman farms to country estates. Reichmann’s story is told in clear, beautiful language that might seem quaint today. He chronicles the few failures and the many successes,especially their efforts to restore part of the property (which had been extensively grazed) to its native state. The Reichmanns were among the first conservationists in Barrington, and the restoration of some 20 acres took almost 15 years. Their joy at the emergence of oak saplings and wildflowers from the previous tangle of brush and weeds caused them to join The Wildflower Preservation Society, Inc. “Young oak trees began to emerge from the welter, and the wild flowers of the spring and summer signaled the return to nature’s estate”. They called it Wildwood. The cultivation of their rose garden was an enduring success, for that, unlike many of their endeavors, survived the Second World War years when help was scarce. 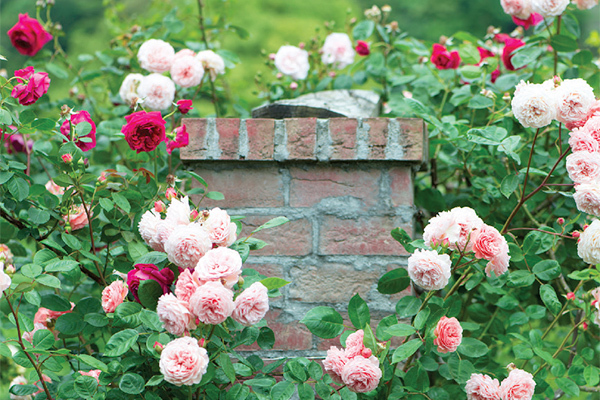 Fifty varieties of roses suited to the climate were included in Mrs. Hammond’s original design: Hybrid Teas, Hybrid Perpetuals, climbing roses, and bush roses. For the Reichmanns, this was a perpetual joy, and when writing his Reminiscences, Reichmann said that during the growing season they might pick as many as 10 to 15 dozen roses a day. The story of Oakdene tells of gentler times when Barrington was transitioning from a rural farm community to a growing village in the 1920s. Unbeknownst to many, the Reichmanns’ Oakdene legacy remains an inspiration for Barrington area gardeners and conservationists of today. Barbara L. Benson grew up in Kent, England, and later moved to New York. She settled in Barrington and has walked with our history ever since she first arrived here in 1980.